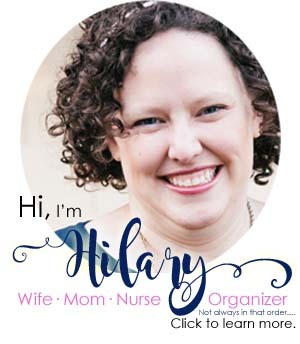 Save on an Owlet Monitor: Does a NURSE really think it's worth it? This post is all about looking for ways to save on an Owlet monitor or an Owlet promo code. But first, let’s find out if it’s actually worth it (because, even with a coupon code you want it to be WORTH IT) — from an L&D RN. 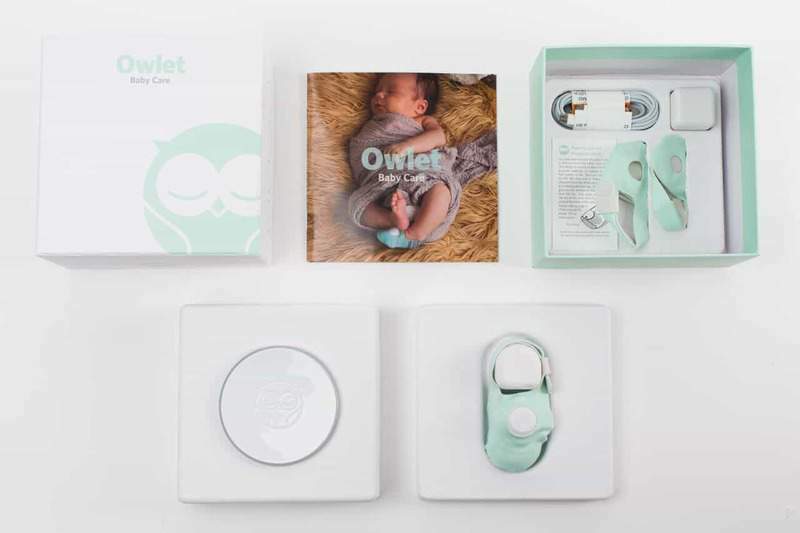 Owlet has also announced the Owlet Cam — which will be shipping fairly soon! I have a whole post about the Owlet cam, and how you can buy both for a great price break! 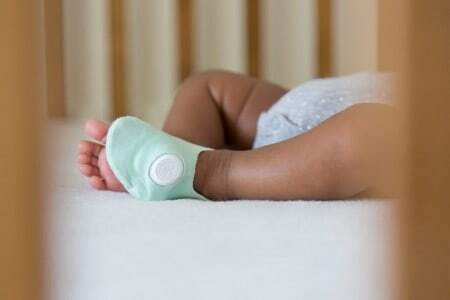 The biggest perk of the Owlet cam is the ability to use just one app for the cam and the sock. While the camera is nice, if I wasn’t buying the sock — I doubt I’d buy the camera as well. But, you can read all about it in this post. But first, is it worth it? Let’s find out more about the Owlet Monitor (if it’s horrible, no coupon code or promotional code in the world would make it cheap enough). Having a newborn is tough stuff. The one thing that really gripped my heart was the worry. The worry that they’d cry and I’d be so asleep I wouldn’t hear it. Have you had the dream where you had a baby and forgot to feed it and then it shrivels up into a zucchini or something? Well, I’m always worried I’m doing something wrong or my extreme lack of sleep will help me to do something REALLY stupid, and something I’ll really regret (which is why you don’t co-sleep). I do things like creating a safe sleep environment to help eliminate as much as possible, but babies are little helpless beings. As a reminder, that means baby, on their back on a firm surface with no bumpers, pillows or stuffed animals. You’ll wake up after 4 hours of AMAZING sleep and your first thought is worry. Worry if they’re alright. Not OH MY GOSH THAT SLEEP WAS BLISS. But new technology can help you sleep a little more worry-free. 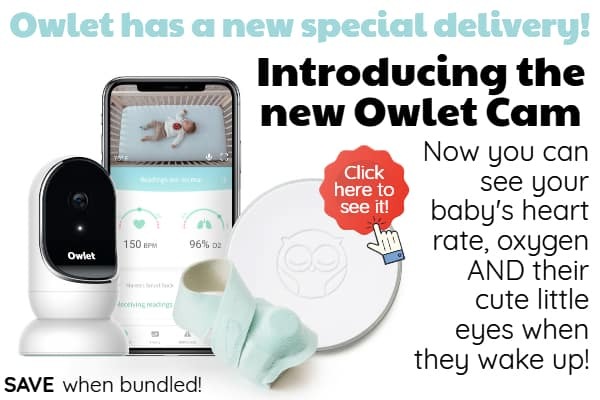 Is there an Owlet baby monitor Promo Code? The short answer (as of now) is, no. BUT…. Sometimes Owlet has Refurbished units — if they are available, you can find them here. You can do a monthly payment schedule. Just click ORDER NOW and then scroll down for low-cost financing! Owlet has made the choice to no longer offer promotional or discount codes on their monitors, if this changes — I will update this post. From time to time they have other offers/financing plans they might list on this page. However, I believe the monitor to be well worth it, even without a discount (and I appreciate that they are making the monitor at a good price for everyone, rather than discounting it for just a few). The Owlet refurbished unit is just the same as a the regular Owlet Sock. Each Owlet Refurb goes through a 13-point inspection to make sure it’s the highest quality. Like ALL Owlet it comes with a 45-day peace of mind guarantee — if, for any reason, you decide it’s not worth it — send it back! I have heard of issues with people needing to use the warranty prior to the smart sock 2, but since they released that — I feel like quality has gone up and there are less issues (I’d heard of some issues with the USB ports). I believe the Owlet Refurb is a great option at an awesome price point. I’ve also heard of people who have had issues outside the warranty area who have still had help from Owlet. I think they want really satisfied customers! I have no idea. There are some foundations that do give them out, but, in general, the Owlet will likely be purchased basically at full price. That’s their business model. ACK — somehow the video isn’t on Youtube anymore…. but Michelle had a VERY premature baby, and felt SO much relief when she brought her home, because of the Owlet! If you have had a premie I’m sure you know how Michelle feels. Anyway, the owlet uses the same pulse ox technology that we use in the hospital. It will sense how much oxygen is in their blood, and it will notify if it goes below 80% for a certain period of time. If the booty fits your baby, it will work. – usually up to about 18 months. It has a base station that sends you updates (that’s the circle thing), and it can also notify you via your phone! **As a reminder, we have no idea what really causes SIDS and as such, the Owlet can’t prevent something we don’t understand. 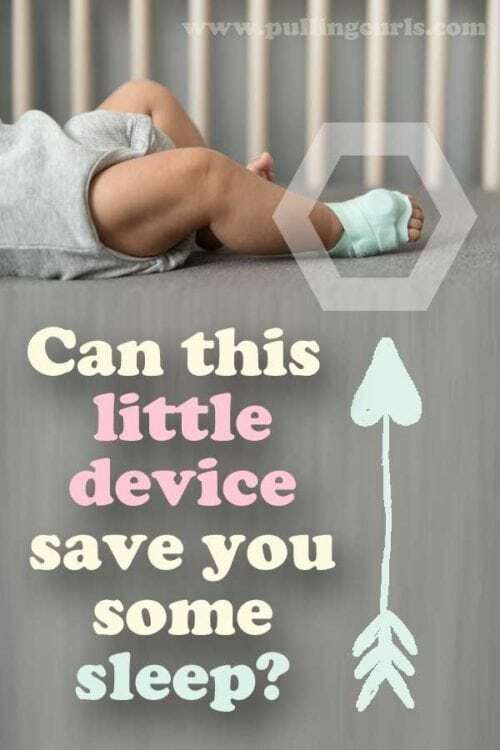 Owlet is designed to notify you if your baby’s heart rate or oxygen fall outside the preset zones. It’s like an extra set of eyes in the nursery allowing you a good night’s rest. Ok, who am I kidding, but I think you’ll get some peace of mind and hopefully even MORE sleep. Go to their website, and check it out! However, I wouldn’t put this as priority #1, if money is tight. 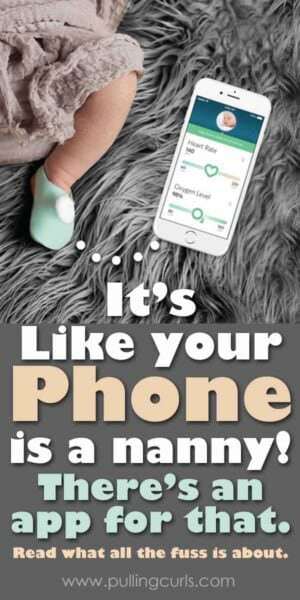 Plenty of babies live without it. BUT, if you have the cash, I think it can help your worry. It has a better more, comfortable sock design. 10X extended Bluetooth range so you can the base station in another room. Connected Care (health history and tracking) is available. You can do a monthly payment schedule. Just click ORDER NOW for financing for as low as $22/month. They sometimes have in stock refurbished monitors (if they’re in stock, they’ll be on that page). 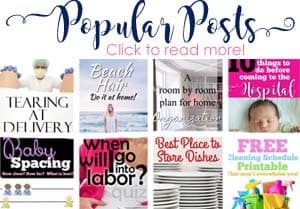 When you purchase through Pulling Curls, you support our blog to bring more great baby content! Just the same way our oxygen monitors work in the hospital. A little light senses (through magic, I think) how much oxygen is on each blood cell, and it can also sense heart rate as it sees the blood move through their foot. Who is the Owlet the most worth it for? 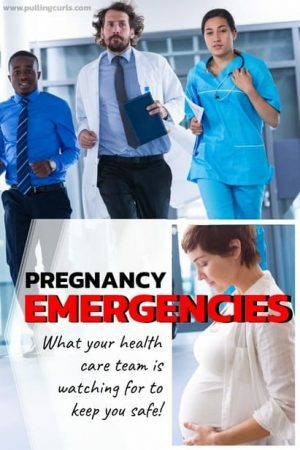 If you find yourself anxious frequently about the well-being of your baby, I think you would find this helpful. If you’re pretty chill and you feel pretty comfortable about your baby’s safety, I think you could live without it. 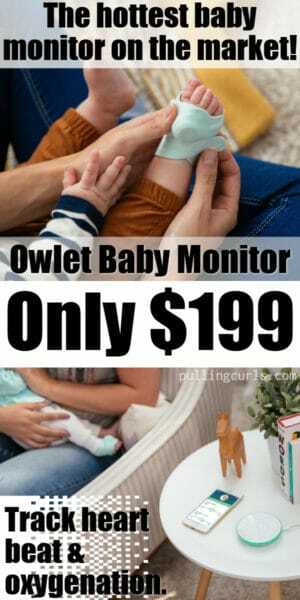 Are there coupons for the Owlet monitor anymore? No, not really. I have asked and they have said no. Every now and then you’ll include a swaddle blanket or something with the monitor. I’m careful to email my list when something like that happens. However, while that does provide some added value, I don’t think you’ll find a better price (besides their refurb option). What’s the difference between the refurb and the regular Owlet monitor? It goes through a 13 point inspection to make sure that it still works. You get a 45-day guarantee. SO, if you are planning to purchase a refurb monitor, I might not grab one until closer to your due date. That way you’d have a good long while to use it and try it out to make sure it works well. 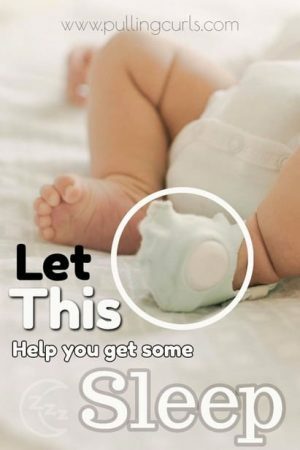 OF course, you can also make sure it works on yourself, or another child if you hold the light points on their foot or hand. If money isn’t too much of an issue, I’d recommend getting the full unit as it does come with a better warranty. Anything I’ve ever heard negative about the Owlet is about cords not working or things like that, so I’d prefer a bit more peace of mind. This post was originally written in 2015 but has been updated.